Ice Damming can be a very expensive problem.On this page you will learn how and why ice damming occers,Don’t worrie there are ways to help prevent ice damming for happing to your home .please read the following information to see how. Why is Ventilation so important when it comes to ice damming?Your Attic needs to be able to “breath”.In the winter when your homes heat can not escape your attic fast enough it heats up the surface of you roof and water melts from the top down to the cooler area at the eave were it then re freezes.When this ice builds up, it creates a dam of ice, water builds up behind the dam therefore entering your house.Remember a roof is designed to shed water not hold water. Over the years many roofs will experience some sort of wetness. Typical roofing felt paper sometimes isn’t enough, especially for problem areas. When the time comes to replace your roof, consider the water repellant effects of ice and water shield and it’s invaluable protection of your home’s exterior. Sometimes called weatherguard or weathershield, ice and water shield is a rubberized material that comes in a roll just like felt paper. Typical places for ice and water shield applications are along eaves and in valleys. Some roofers will use it around vents and chimneys as extra protection. 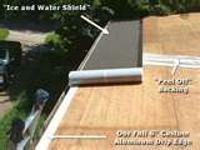 Typically one side of your water shield roll is extremely sticky and will adhese itself to your roof sheathing. The other side has a thin plastic backing that needs to be peeled off before applying. The upside of your ice shield roll has a sandy texture to it. Be extra carefull walking on the plastic after being removed. It is extremely slippery on a roof! Also be aware of walking on your ice and water shield after installation, especailly in summer heat. When installing ice and water shield, it is best for two people to work together and use only 8-10 feet sections. Often times trying to roll out your ice shield results in unwanted ripples. It’s better to use sections with at least a two inch lap onto the previous piece. If you are installing more than one row across your roof, be sure not to have a seam directly above another seam. It’s typically alright to nail areas that will then be lapped by the next piece of water shield. Your ice and water shield will cost you more than felt paper, however the added benefit can be well worth it. On low pitched roofs it’s highly recommended to install it at least along the eaves of your roof where a backup of ice, snow and water usually occurs.